I stumbled across the concept of Attraction Marketing quite accidentally. The first person I encountered talking about this was Ann Seig and The Renegade Network Marketer System. I didnt know what it was at the time but am living proof that the concept works. Attraction Marketing turns the normal concept of sales on its head. Gone are the days when you needed to spend endless hours chasing prospective customers and gently "persuading" them that what you have to sell is just what they need. Old fashioned methods of hard sell just do not work in todays day and age. The Internet has opened up international barriers and the technology that we have at our fingertips means that there are other ways to chase our customers. Whereas anyone in marketing previously had limited time and resources, now the Internet has enabled us to leverage our time so that we are able to put our systems to work 24 hours a day 7 days a week. No, that doesnt mean that we have to physically work 24/7 but our resources and systems are doing the legwork for us. Whilst people love to buy and shopping has become one of the worlds favourite hobbies, people hate to be sold. It sounds bizarre but think about it and it makes sense. We love the buzz we get when we find or buy something that fills a need that we have but hate it when someone pounces on us trying to persuade us that we really do need the latest gadget or widget or whatever. I personally think it is about choice. We like to think that we have made our own choices and have not been forced down a route that doesnt suit us. Not only are we much more discerning but our understanding of the psychology of buying has come on in leaps and bounds over the last decade or so. We like to think that we are calling all the shots and making our own decisions. We have also become much more wary of people out to scam us. The business model I work with includes Network Marketing, but even if your home based business has nothing to do with Network Marketing, Attraction Marketing is the key to your success. The basic concept of attraction marketing is not to persuade anyone into buying anything. We let them find us by offering information and advice, overdelivering on relevant content and gradually build their trust to position ourselves as the expert or market leader in whatever field we are working in. The fact that the internet is so huge and works in the way it does, enables us to target thousands of potential customers in ways that previously was unheard of. In the past, particularly in network marketing, geographical location was key and finding enough people that lived close enough for you to work with was almost impossible. In the online world, geography has nothing to do with your business. As I said before, technology makes it possible for us to communicate cheaply with people the other side of the world. The only thing holding us back is our ability to get up early or in the middle of the night to do so! This goes for advertising too. When we advertise using the Internet we target people that might be interested in our business through relevant information. This means in practice that we can show a relevant advert to thousands of people across the world 24 hours a day. Now not all of these people will be interested in what we have to say but actually that doesnt matter. If we can attract a reasonable volume of people who are interested in what we have to say, all we have to have is the perfect system. Find out more about Attraction Marketing in this incredible Free Report. In my consultations with people involved in Network Marketing, the lack of network marketing leads is the single biggest problem I encounter. Compiling a list of people you know, harrassing family and friends just doesn't work! So how are you supposed to find enough people genuinely interested in building a Network Marketing Business? What this means in practice is that we are able to generate warm, highly targetted mlm leads for our business at neutral cost. As they progress through the stages of our marketing model we are able (sometimes) to earn a little more money which means that when we finally get to speak to them we are not desperate for their business. In addition we are seen as someone in a position of authority and someone with whom people would like to work. If you're sick of harassing your friends and co-workers about your "business opportunity" and going broke buying leads that only turn out to be duds... you may be interested in learning what more and more internet entrepreneurs know about marketing. 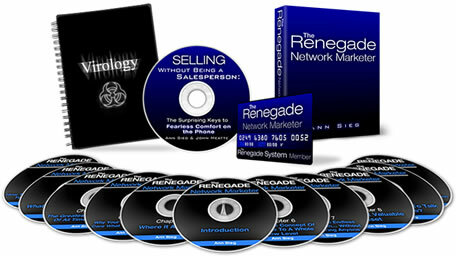 Find out more about The Renegade Network Marketer System and how you can attract people to you through free and cheap methods of social marketing. Paying for advertising is no longer necessary and you should only have to do this once you are making a profit. Find out more about Attraction Marketing in this article I wrote on making sense of the subject.